Our researchers regularly write Opinion Pieces and Articles for on-line news services such as The Conversation, The Policy Space and more. Associate Professor Dominic O'Sullivan writes "Each of the United Nations’ (UN) 17 Sustainable Development Goals (SDGs) has special relevance for the world’s 500 million indigenous people. They are among the world’s poorest and most alienated from public decision-making. Yet, they are increasingly using international forums like the UN to exercise an assertive and decisive political voice," appearing in Impakter, March 28. Associate Professor Dominic O'Sullivan discusses how white supremacism, the ideology driving the Christchurch killer, is prominent and influential in our politics and says racism’s pervasive influence is a deeper problem for which decisive and unequivocal national leadership is required, in The Open Forum, March 28. Associate Professor Dale Nimmo et al write that the Australian government’s target of killing 2 million feral cats by 2020 attracted significant public interest and media attention when it was unveiled in 2015. But in their new research, published Feb 19 in Conservation Letters, they explain why it has a shaky scientific foundation in The Conversation, February 20. The Universal Declaration’s inference that everybody is entitled to share public sovereignty exists alongside the UNDRIPs presumption that there is also an extant independent indigenous sovereignty. 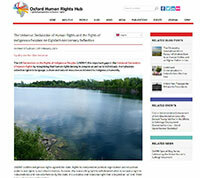 Recognising co-existence of different though overlapping spheres of authority provides a possible path towards substantive human equality for indigenous peoples as much as for anybody else, writes Associate Prof Dominic O'Sullivan, in The Oxford Human Rights Hub, February 11. What is the Crown, what is sovereignty and how do these relate to citizenship as it has developed from the British subjecthood that the treaty promised? asks Associate Professor Dominic O'Sullivan in The Conversation, February 8. Many women love the alone time pounding the pavement for a nice run out in nature, but is this too strenuous? We asked five experts, including the Institute's Professor Rylee Dionigi, if it’s safe to run while pregnant, The Conversation, January 28. Dr Lee Baumgartner and Professor Max Finlayson continue the Institute’s input into discussions around the fish kill in the Darling River and remind us the Native Fish Strategy lays out a plan for helping the basin’s fish communities recover from where they are now, at 10% of pre-European levels (0% in some parts), back to 60% over 50 years in The Conversation, January 21. The complexities and limits of the Crown's "duty to consult" over decisions affecting First Nations' rights is discussed in A/Prof Dominic O'Sullivan's latest Conversation article, November 30. How do you measure the success of conservation efforts? Professor Dave Watson and 17 colleagues from a dozen Australian universities along with scientists and private researchers have created a metrics of progress to understand how to manage threats of different intensity and how well that management has been implemented, they describe their analysis of Australian birds in this new article in The Conversation, November 27. Associate Professor Dominic O’Sullivan’s analysis of the results of the Fijian election argues that restrictions on free speech mean that there is no way of testing popular Fijian opinion. He says “It may have been a free vote. But the conditions for an informed vote – scrutiny and robust debate - were not present” in his piece appearing in The Conversation, November 20. Associate Professor Dominic O'Sullivan explores the issues as Fiji faces a general election on Wednesday, just as Australia’s main political parties devote more attention to the western Pacific, driven by worries about China’s growing influence in his opinion piece in The Conversation November 12. 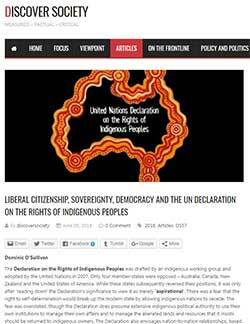 Re-imagining the sovereign: An Indigenous case study in citizenship, self-determination and democratic inclusivity. In his recent article, Associate Professor Dominic O'Sullivan says “Sovereignty is the embodiment of real political power. 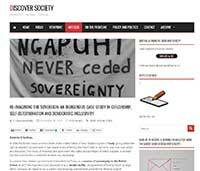 People should not feel perpetually excluded from it and there are ways in which public authority can be distributed more fairly and to recognise Maori self-determination.” in the Discover Society, November 6. Associate Professor Dominic O’Sullivan says “The only moral defence in favour of celebrating Australia Day on 26 January is to somehow find a way to make it genuinely inclusive. Proponents of the day, particularly Morrison, need to show the political vision that takes the country beyond the dispossession and exclusion that Australia Day represents for some people.” in the Conversation on September 27. “Drain the swamp” has long meant getting rid of something distasteful. Actually, the world needs more swamps – and bogs, fens, marshes and other types of wetlands. A new article by Professor Max Finalyson et al in The Conversation, September 12. The New Zealand government’s decision to close charter schools has prompted criticism from Māori leaders because some of the schools have predominantly Māori rolls. Professor Dominic O'Sullivan discusses the complexity of the politics of Maori policy issues which are larger than just the charter schools in The Conversation, August 30. Dr Katherine McFarlane says "the Victorian proposal fails to acknowledge the ongoing harm that state practices had on thousands of people. 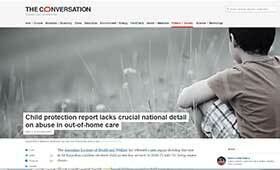 It is also silent on the ongoing criminalisation of children in care today," in The Conversation, July 30. Racism means people experience citizenship differently. It means opportunities and capacities are not equally available to every citizen and egalitarian justice, the idea of a “fair go” for everyone, doesn’t work as it’s intended. Associate Professor Dominic O'Sullivan explores the why some people don't get a fair go at school in The Conversation, July 6. Sovereignty is a type political authority. But it is relative and relational to the political authority of others. Associate Professor Dominic O'Sullivan discusses the challenges and constraints to be faced in the treaty negotiations with Indigenous people in The Conversation, June 25. Are you scared of sharks? If you never read or watched the news, would you still be? Associate Professor Peter Simmons and Dr Michael Mehmet discuss their findings from a running series of focus groups in coastal communities in New South Wales last year in their article in The Conversation, June 22. 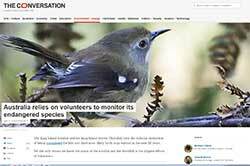 The efforts of unpaid volunteers to monitor Australia's threatened species and the threats posed by the cutting of funding for biodiversity conservation and protection by Professor Dave Watson, with co-authors Dr Matthew Webb and Dr Dejan Stojanovic from the Australian National University, The Conservation, June 11. In his opinion piece in The Guardian, Professor Dave Watson explains his reasoning behind the decision to resign from the NSW Government’s Threatened Species Scientific Committee following that Government’s passing of its “brumby bill” which gives horses special dispensation to roam freely in the Kosciuszko National Park. He outlines why that the decision showed a willful disregard for science, The Guardian June 11. The Declaration on the Rights of Indigenous Peoples was drafted by an indigenous working group and adopted by the United Nations in 2007. Only four member-states were opposed – Australia, Canada, New Zealand and the United States of America. While these states subsequently reversed their positions, it was only after ‘reading down’ the Declaration’s significance to view it as merely ‘aspirational’. 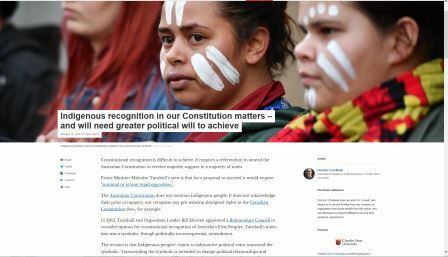 Associate Professor Dominic O'Sullivan discusses current implications for the UN Declaration on the Rights of Indigenous People in his article in Discover Society, June 5. 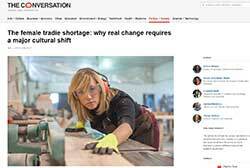 ILWS researchers Dr Donna Bridges, A/Prof Branka Krivokapic-Skoko, Dr Larissa Bamberry and CSU researchers Dr Elizabeth Wulff and Ms Stacey Jenkins have been leading a research project that has shown that boosting the number of women in the manual trades requires cultural shifts in society as much as within the industries themselves in The Conversation, June 1. "The university’s most important strength is its intellectual independence and the academic freedom that assures that independence. Research for government or for industry is not independent" A/Prof Dominic O'Sullivan argues that the funding is too narrowly focused and needs also to consider the university’s democratic purpose in his latest article in The Conversation, May 29. "Our main reason for writing this article was to try to let people know that within the operating environment we’ve got (the volume of water, restrictions on release rates, limited ability to get water onto floodplains, etc.) good things ARE being achieved for the environment. That seems to be a message being lost in much of the media." An article in The Conversation co-authored by LTIM leaders including ILWS's Prof Robyn Watts, A/Prof Skye Wassens, May 1. "Given the power of the media in influencing and shaping public opinion, how gendered power and gender inequality are discussed in the media is critical to how women are perceived in society," says Dr Donna Bridges in the co-authored The Conversation article, April 23, "How the media represent men’s sexual violence and women’s struggles to participate in a male-dominated institution enhances or inhibits the potential for real change." A/Prof Dominic O'Sullivan argues a society that needs to debate the merits of a professional body instructing its members to avoid biased, discriminatory or racist practice is likely to have wide differentials in health outcomes across population groups in his article in The Policy Space, April 4. I've always wondered: can two chickens hatch out of a double-yolk? 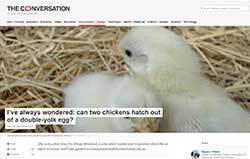 Dr Maggie Watson answers the double-yolk to chicken question in the Conversation series "I've always wondered...." where readers send in questions they would like an expert to answer, March 30. 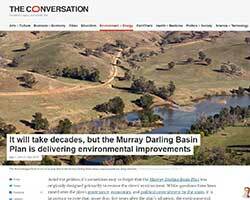 Great little article: Australia's draft 'Strategy for nature' doesn't cut it. Here are nine ways to fix it. 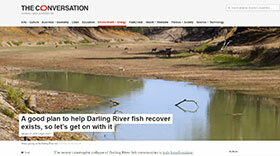 The Conversation article has been co-authored by ILWS ecologist A/Prof Dale Nimmo, March 16. Dr Katherine McFarlane's comments in her article in the Conversation on the child protection report "amidst all the statistics, tables and figures, one crucial measure for benchmarking, identifying and acting on child abuse is missing, March 9. Associate Professor Dominic O'Sullivan writes about the role that universities might play in Indigenous people’s education and research as part of a series in The Conversation exploring ideas for reforming higher education in Australia, March 2. 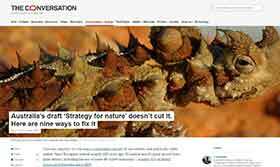 A new article by ILWS Adjunct Dr Matthew McCartney and ILWS Director Prof Max Finlayson 'Exaggerating the value of wetlands for natural disaster mitigation is a risky business' has been published on February 2 in The Conversation.It was picked up by the online news environment guru, Feb 3. Dr Emma Rush, a lecturer in Philosophy & Ethics, is one of the authors of a piece in The Conversation https://theconversation.com/how-do-you-remember-a-rock-god-the-complicated-legacy-of-chuck-berry-74835 commenting on the life (and death) of Chuck Berry, March 20. While projects to remove invasive species may yield great benefits, we must be aware of the potential risk of unexpected and undesirable outcomes say Drs R. Keller Kopf, Dale Nimmo and Paul Humphries in the Conversation, May 24.